This article was written by Erik Hupje, Maintenance and Reliability Leader. For most of human history, we’ve had a very simple approach to maintenance: We fixed things as they broke. This is referred to as First Generation Maintenance and was a common approach up until World War II. By the 1950’s, a focus on preventing equipment failures emerged. Second Generation Maintenance was based on the idea that failures could be prevented with time-based preventive maintenance (PM). Fixed-interval overhauls or replacements to prevent failures became the norm. The real breakthrough in maintenance and reliability happened between the 1950s and 1970s. A third generation of maintenance was born in the aviation industry. During this period, a detailed study of the airline industry was commissioned using 12 years’ worth of data. The task force made the astounding conclusion that overhauls had little or no effect on overall reliability or safety. These findings led to the development of reliability centred maintenance—an approach based on reliability rather than time. However, many of our PM systems today are driven by outdated time-based thinking rather than reliability principles. Here are eight tips for optimizing PM using reliability centred maintenance principles and a CMMS system to implement them. Not all failures can be prevented by maintenance. There is no value to be gained by trying to prevent failures outside our control, like those caused by lightning strikes or flooding. Good design can make a difference here, but not maintenance tasks. Some failures have such minimal consequences, that the right thing to do is to allow the failure to occur and then perform the repair (e.g. general lighting). Also, good maintenance programs will not try to prevent all failures. These low-consequence failures should be recorded in your CMMS, but don’t waste any more time with failure analysis and the development of irrelevant PM tasks. Preventive maintenance tasks that are purely time-based often waste time and resources. For the 70% of equipment with a constant probability of failure, there is no point in doing time-based life-renewal tasks like servicing or replacement. In practice, this means that 70% – 90% of equipment would benefit from some form of condition monitoring, and only 10% – 30% can be effectively managed by time-based replacement or overhaul. The majority of our PM efforts should be to perform condition monitoring tasks that detect component wear before a failure occurs, giving time for adequate planning and scheduling. CMMS systems can capture condition monitoring results and compare these to a baseline. Maintenance tasks can be generated automatically when a threshold is reached. Only where we can prove that an item has a wear-out age does performing a time-based overhaul or component replacement make sense. Maintenance should be seen as an investment. You incur a maintenance cost in return for the benefit of sustained safety and reliability. As with all good investments, the benefit should outweigh the original investment. 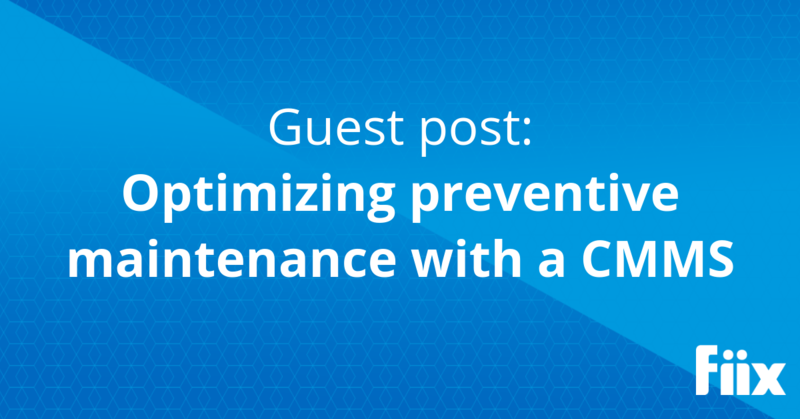 A maintenance program should consider both the consequence and the likelihood of failures. And since Risk = Likelihood x Consequence, we can conclude that good maintenance programs are risk-based. Use the concept of risk to assess where to use your scarce maintenance resources to get the biggest return on your investment. CMMS systems allow you to capture the maintenance costs associated with failures. Over time, this data can be used to calculate the cost of a failure in terms of maintenance spend. This is one consequence of failure. However, higher costs are often associated with downtime and loss of production when calculating risk. PM tasks are a great way to find hidden failures. These are failures that remain undetected during normal operation and only become evident when you need the item to work (failure on demand). Or when you conduct a test to reveal the failure—a failure-finding task. For example, consider a high-high pressure trip that is not normally active. It is only required to function by exception to protect your people, the environment, or assets. Testing the pressure switch will reveal whether it is working normally or whether it has failed. To be clear, a failure- finding task does not prevent a failure. Instead, a failure- finding task seeks to find a failure that has already happened but has not been revealed to us. PM tasks help us to find hidden failures and fix them before the equipment is required to operate. These PM tasks form part of the safety system of the facility and assign accountability for testing its functionality. CMMS records are often used in incident investigations to verify compliance with safety regulations. Just because two pieces of equipment are the same, it doesn’t mean they need the same maintenance. In fact, they may need completely different maintenance tasks. Using PM maintenance libraries leads to a generic list of PM tasks for every similar equipment. However, a pump in standby mode requires different PM tasks than one that is continuously running. Equipment in different service may have different consequences of failure and should be allocated PM resources accordingly. The more generic a PM system is, the more wasteful it is. While CMMS systems make it easy to duplicate tasks and keep consistency across the facility, avoid wasting valuable resources by not overusing this function. “You can’t maintain your way to reliability.” I love this quote from Terrence O’Hanlon, and it’s so very true. Maintenance can only preserve your equipment’s inherent design reliability and performance. If the equipment’s inherent reliability or performance is poor, doing more maintenance will not help. An analysis of existing PM tasks, as well as causes of failure, can be used as critical inputs to a defect elimination program. Don’t try to use PM to overcome a poor design. Neither should you accept an abnormally high failure rate because of poor design. Rather, use your CMMS statistics and failure mode analysis to fix the design so that you can reduce PM tasks that aren’t really solving the problem. Performing unnecessary tasks wastes valuable resources. Even so, it’s common for people to say “While we do this, let’s also check this. It only takes five minutes.” However, every five minutes we add here, we have to remove from somewhere else. Carrying out unnecessary tasks can also make reliability worse. Another source of waste in our PM programs is trying to maintain a level of performance and functionality that we don’t actually need. Equipment is often designed to do more than what it is required to do in its actual operating conditions. We should maintain our equipment to deliver to operating requirements. Maintenance done to ensure equipment capacity is greater than what’s actually needed is a waste of resources. Similarly, avoid assigning multiple tasks to a single failure mode. Stick to the rule of a single, effective task per failure mode as much as you can. Only for very high consequence failure modes should you consider having multiple, diverse tasks to a single failure mode. Be ruthless with your PM tasks, only doing those tasks that you are certain will have the desired effect. Implementing a rigid change control process on your CMMS will prevent people from making easy changes to the system that are not necessary. The most effective maintenance programs are dynamic. They are changing and improving continuously, always making better use of scarce resources and becoming more effective at preventing these failures that matter most to the organization. When improving your maintenance program, you need to understand that not all improvements will make the same impact. First, focus on eliminating unnecessary maintenance tasks. This eliminates the direct maintenance labour and materials, but it also removes the effort required to plan, schedule, manage, and report on this work. Second, change time-based overhaul or replacement tasks into condition-based tasks. Instead of replacing a component every so many hours, use a condition monitoring technique to assess how much life the component has left. Then replace the component only when it’s actually required. Finally, extend task intervals. Do this based on data analysis, operator and maintainer experience (or simply on good engineering judgment). Remember to observe the results. The shorter the current interval, the greater the impact when extending that interval. For example, adjusting a daily task to weekly reduces the required PM workload for that task by more than 80%. This is often the simplest and one of the most effective improvements you can make. For the last 20 years, Erik Hupje has worked around the world as an asset management engineer, specializing in maintenance and reliability in the upstream oil and gas industry. He is the founder of R2 Reliability and developed the Road to Reliability framework for effective preventive maintenance engineering.